Good timing leads to partnership between Process Equipment and Schafer Gear. Publisher Michael Goldstein describes the remarkable accomplishments of Randall Publications LLC over the past year, despite the intense and hectic transformation he and the staff experienced unbelievable strain on their time and concentration. The complete Product News section from the July 2010 issue of Gear Technology. Manufacturing is a hot topic everywhere these days, what with economic stimulus plans targeting the struggling industry worldwide. Many hopes are tied to a manufacturing recovery to bring us further up out of the economic doldrums of 2007–2008. Most indicators show that manufacturing is climbing back, so what better time for the International Manufacturing Technology Show (IMTS) 2010 to witness first hand the next generation’s technology. The complete Technical Calendar from the July 2010 issue of Gear Technology. 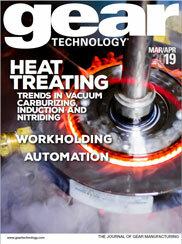 The complete Industry News section from the July 2010 issue of Gear Technology. A treasure trove of gear and power components for aspiring engineers and dedicated hobbyists.